Every day we invest in the most efficient technologies to guarantee you the maximum of flexibility and quality in any manufacturing. Sectioning of panels or postforming bars, by means of machines with a computerized systems for the optimization of the cutting phase in order to reduce at least the waste material. Edging on straight sides with a machine in line For panel depths up to 60 mm – doors and postformated plans included. There is the possibility to put on paper, PVC, wood or ABS edges from 0,4 mm to 3 mm or solid woods up to 20 mm. Edging on shaped with the center of the work to CNC for paper, PVC, ABS or wood edges up to 3 mm. Five different centers of the work give the maximum of flexibility in shapes, dimensions, depths and speed of execution. Supply of plated panels in different kind of woods, laminates, veneers, honey-comb panels, in the maximum sizes of 3500 x 1700 mm. Traditional polyurethane and acrylic systems of painting, water paintings, direct glossy lacquered and polished. 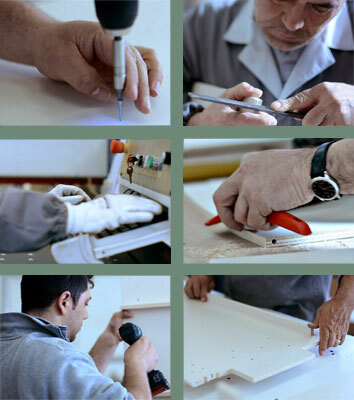 With the latest generation machines, we have all the traditional ones for carpentry and also with our skilled craftsmen, we can fill the requests of special items, oversized and manufacturing prototypes, counters, unique pieces for architects and designers. With the intention to guarantee a complete service on demand, we can also supply assembled or packaged products, ready to be shipped in every part of the world. After specific agreements, we can manage internally Your warehouse and deliver requirements stores.